It features steel frame, tempered glass face, fashionable design and stable display performance. A perfect match for hotels and can also be used at bank, store, airport, hotel, station, summit, theatre and other indoor areas. It features a beautiful iPhone shape measuring 890mm, 2100mm and 100mm in length, height and width respectively. It's lighter than traditional advertising players which make it easy to transport and install. The P2.5 LED Screen for Shop is manufactured from a powder coated steel base and aluminum allow frame which gives it a beautiful look and extra strength. The surface is coated with a smooth and seamless tempered glass that present clear pictures and more safety. Best Indoor Advertising is very easy to operate - just plug it into any device and play. Supports a wide range of devices. The integrated design has everything in-built like Apple box, loudspeaker, control card and power supply. Plug and play is very convenient to use. 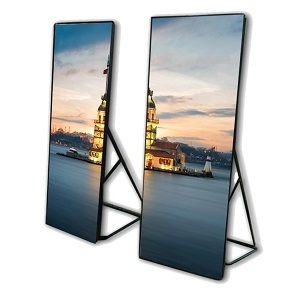 2.5mm high resolution pixel pitch offers excellent quality pictures and display performance. The high contrast ration screen shows your advertisements with great clarity. Suitable brightness makes it ideal for indoor advertising. Connect your Apple device by Apple STB and control many different devices. Remain in full control with its unique controlling features and powerful remote control. Work at home with utmost ease and convenience. The P2.5 LED Screen for Shop can be used at different places and can serve different purposes. Starting from a private club reception to hotel lobby and bar, it can be installed anywhere. It can be used for advertising purpose and for entertainment purpose, for information broadcasting and training.